If you own a pair of adorable hamsters, you may notice that they can be rather communicative to each other -- which may bring upon hours of fascination to anyone watching them. 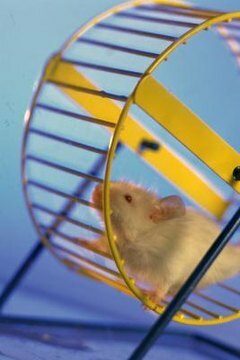 Squeaking can indicate a wide variety of different hamster moods, from fearfulness all the way to playfulness. If a hamster squeaks in the presence of another hammie, then it may be a sign of playtime -- yippee! All is fine in your hamsters' world, and they're simply enjoying a lively session of playtime "fighting," complete with enthusiastic vocalization. Playful fights usually come about due to the desire for social dominance in the cage. A hamster may squeak in the midst of a legitimate fight with the other hammie, as well. If your hamster's squeaking accompanies a fight that seems particularly long-lasting or violent, it probably is a sign that you have to keep the pair away from each other and put one in a different living cage -- for good. Take action immediately if you think this is the case. If a hamster is squeaking with or without being in the company of another, it sometimes is an indication of a problem. Perhaps the squeaker is feeling irked and annoyed by the other hamster. She may be in fear of the other hamster for whatever reason. She may be injured or otherwise feel unwell, in which case it may be time to notify your veterinarian. The squeaking also could be a plea for some good, old-fashioned attention, nothing more and nothing less. A squeaking sound also can be a sign of pure joy and happiness. If it's time for food or grooming, a wee hamster simply may not be able to contain her giddiness about the situation -- aww. Keeping two hamsters in just one cage is only appropriate in the case of Dwarf hamsters. Two dwarf hamsters typically thrive when living together -- as long as they were brought together at a young age, however. Other types of hamsters, such as Syrian hamsters, can be highly territorial and as a result must live on their own -- no exceptions.